Garlic is ready to be harvested when half of the stems have turned brown (half should still be green) and started to dry out. Onions are ready to harvest when the stems start to turn brown and die back. The tops will start to flop over and a portion of the bulb will usually be above the soil surface. 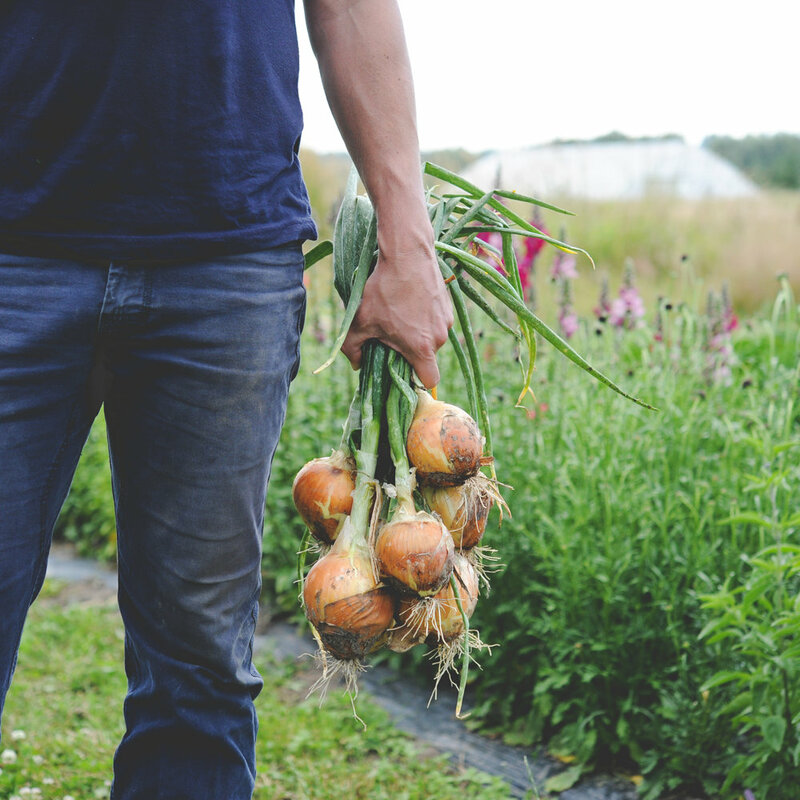 Garlic and onions are harvested by lifting entire plant out of the ground with a spade, fork or trowel (or by hand). With both crops, the less you do to the harvested plant, the longer and better they will store. After harvesting, knock off any large clumps of dirt but never wash your garlic or onions with water. Hang garlic in a warm, dry, dark place for several weeks to cure. After that, the garlic stalk and root can be trimmed back to so that the bulb resembles one that you would buy at the store or farmers market. Cure onions in a dry sunny spot for 5-7 days. Once cured, cut back the stems to about 1 inch above the bulb. Store garlic and onions in a dark, cool location such as a pantry or basement. Softneck garlic should keep all winter long, while hardneck garlic has a shorter lifespan, but, some say, a superior flavor. The storage life for onions depends on the variety. Generally, yellow types store longest, but be sure to read about the varieties you are growing, or planning to grow before deciding which ones to cook with first. If properly cured and stored, it is possible to eat bulbing onions from midsummer through the following spring.